Even with more NYC students taking the SAT and AP exams, scores have increased across the board. NYC students' SAT scores increased in critical reading, writing, and math; while scores on average declined for students nationwide. Mayor Michael R. Bloomberg and Schools Chancellor Dennis M. Walcott today announced a record number of students passed Advanced Placement exams and SAT scores rose while the national average declined, with more New York City students taking each of the exams than ever before. Since 2002, the number of city students taking and passing Advanced Placement (AP) exams has more than doubled and the number of high school seniors taking the SAT has increased by 53 percent. According to data produced by the College Board, SAT scores for New York City seniors increased by eight points since 2012, while the national scores declined by three points. The number of city students passing one or more AP exams has now increased from 9,700 in 2002 to a record high of 19,500 students passing one or more last year. 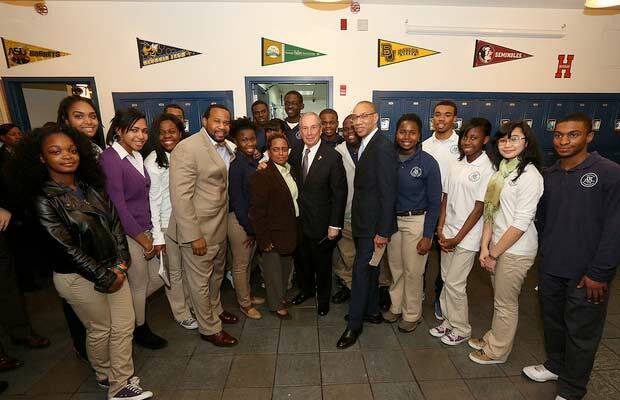 Mayor Bloomberg and Chancellor Walcott made the announcement at Bedford Academy High School, one of the 260 new, small high schools created since 2002 and the number of students taking the SAT at Bedford quadrupled since just last year and the number of Bedford students taking AP exams has tripled since 2006. The number of students taking and passing AP exams has more than doubled since 2002. The number of black students participating in AP exams has increased 13.1 percent since 2012 alone, and the number of black students passing at least one exam increased by 8.2 percent since 2012. The number of Hispanic students participating in AP exams has increased 16.6 percent since 2012, and the number of Hispanic students passing at least one exam increased by 11.4 percent since last year. In the last year, New York City students had greater gains on the SAT compared to the nation. In critical reading, city scores increased by three points, while national scores remained flat. In writing, city scores increased by three points, while national scores decreased by one point. In math, city scores increased by two points, while national scores decreased by two points. These gains in performance on the SAT were across all ethnicities. Black and Hispanic students’ average overall score increased by seven points and 14 points, respectively, in one year. Black students critical reading score increased by three points, while Hispanic students’ increased by five points. Black students’ average writing score increased by three points, while Hispanic students’ increased by six points. Black students’ average math score increased by one point, while Hispanic students’ increased by three points. The College Board also produced the results of its PSAT exams, taken by high school sophomores and juniors. Data shows that students who take the PSAT score significantly higher on the SAT in each subject compared to students who do not; and since 2007, the City has offered all sophomores and juniors the PSAT free of charge during the school day. Last year, over 114,000 New York City students took the PSAT and there were slight score increases in all three subjects. Since 2012, on a scale of 20-80, NYC PSAT critical reading scores increased by 0.8 points; writing scores increased by 1.1 points; and math scores increased by 0.3 points. For more detailed information on how New York City students performed on the SAT, AP and PSAT exams in 2013, visit nyc.gov.